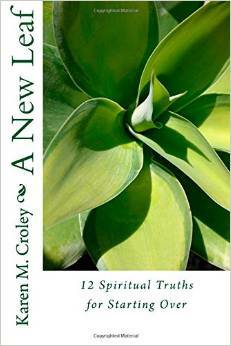 ​﻿﻿A New Leaf: 12 Spiritual Truths For Starting Over will give you the opportunity to deepen your understanding of who you are and what you are capable of, using timeless teachings. Whether starting over is a conscious choice or something that happened due to divorce, loss of a job, the passing of a loved one, an empty nest, or a big move, this book will guide your way. Once you learn and experience that home is in your heart, you will never feel lost again. ﻿﻿"Karen has done what not all healers, counselors or coaches can do, she has taken years of counseling others and years of self care and married them into a succinct practice that can change it all. Read this book and in 12 simple steps know who you are by listening to the inner whispers. If you're in transition of any kind this is your personal guidebook." ​"The Joy Of Life Mastery" Creator, Living Your Success Signature Business http://successsignature.com. "A New Leaf is a truly inspirational book that leaves you feeling more positive about yourself and the world. It offers a clear set of spiritual principles designed to help you turn your life around. The author gives many examples from her own life and her work as a therapist to show exactly how to make the change in your own life. I highly recommend it for anyone experiencing a transition who wants to start over. You too can turn over a new leaf!"